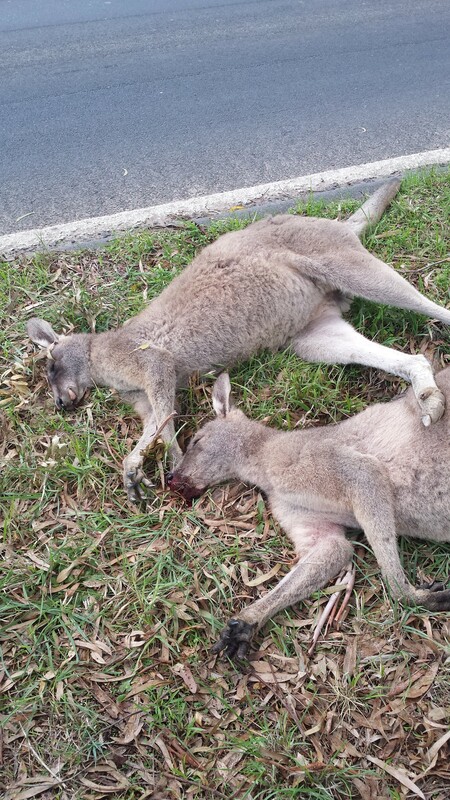 Eastern Grey Kangaroos killed at Boneo. On the early evening of Tuesday the 26 of May, the tranquil peace at Boneo was broken by the sounds of over 100 gun shots ringing out. The farm responsible for carrying out these shots was carrying out a kangaroo cull. However in order to carry out the cull they had to trespass on Melbourne water land to get the kangaroos back on the farm. As you can see in image 1.1 there is no available food on the farm as it has been cleared (cleared very recently in fact). 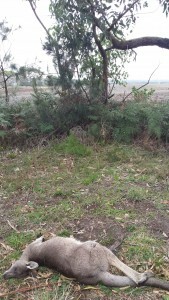 The tree line behind the cleared land is Melbourne Water land where the kangaroo are seeking refuge. A couple of witnesses have claimed that they saw dogs released onto the adjoining Melbourne water land to chase the kangaroos back on the farm where they could shoot them. Unfortunately 2 young joeys didn’t make it off the Melbourne Water land as they were killed by the dogs. It is with much gratitude that I thank a concerned neighbour, who put out feed for the kangaroos who turned up for refuge on their property. A team went out this morning to search for any injured and orphaned joeys. By the morning the kangaroos were back on the Melbourne water land and very agitated. They saw us before we saw them and they fled from us to hide in the thick scrub. As such we were unable to get a good look at them, but it is of my belief there are most likely orphaned and injured Kangaroos in the mob. So after the search was undertaken today (but will continue over the week), actions were taken by the team to ensure that justice for these animals was secured. A complaint was registered, of an offense to wildlife with DELWHP. DELWHP have now started an investigation. 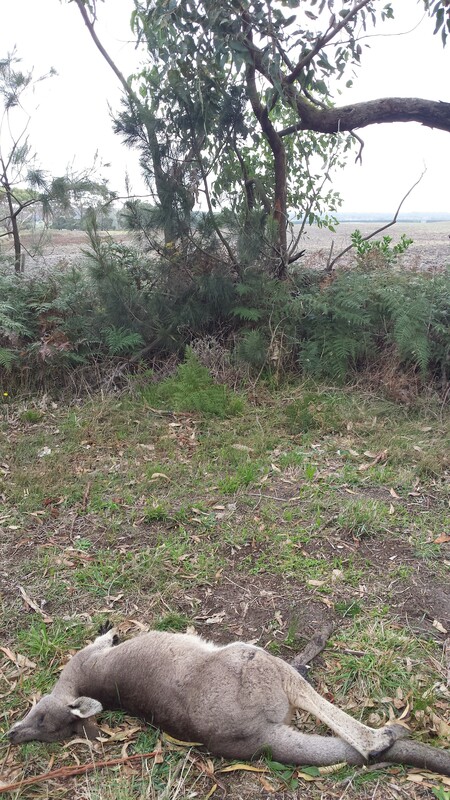 Melbourne Water has been contacted and they will be making an investigation. The police were called as well however they did not seem to concerned. The witnesses to last night’s atrocities have made formal statements to appropriate authorities and departments, and the RSPCA has been contacted as well. 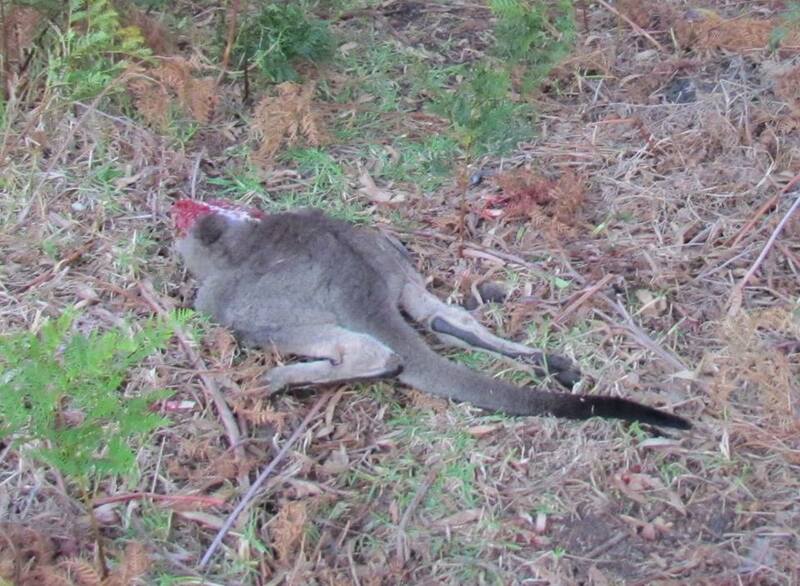 While Kangaroos have been killed, the ghastly actions of last night remain allegations. At least that is until the investigations are over and charges are either laid or not laid. However in these cases more often than not, if the accused is found guilty a very small penalty is handed out. As which is no deterrent to stop the offender from committing this crime again. In this case the accused of these horrifying acts is A&G Lamattina and Sons. They are suppliers of everything from parsnips, iceberg lettuce, cabbage, silverbeet, celery and cos lettuce to Woolworths “the fresh food people” supermarket chain. I ask this of the fresh food people, Are they willing to sell food that has cost wildlife their homes and lives especially that of Australia’s national icon.